It's hard to believe, but Wings900 has been around for over 10 years! We decided to take a trip back in time, and look at how Wings900 got its start, what things used to look like, and what has changed over the years. Special thanks to the WayBack Machine for helping us find these "lost" views of Wings900! For more detail of each era, click on "Go WayBack" and surf the old sites! Please note that parts of the archived sites may not be available. Enjoy! A special thanks to our users...With out your support we would never be where we are today! Wings500 was the first site catering ONLY for the model airplane collector. I worked for a private phone company in Milano with unlimited web access, and in my free time started to design Wings500. From the very beginning, there was a forum and rare models were offered, those to "Gold Club Members" only. The database was pure html those days, but nevertheless was the ONLY source on the web about rare models, in those days herpa models only. The model value, now back on Wings900 in the all new database, was introduced and was the only reliable source for collectors seven years back. Herpa did never support the site, even their website in 1997 was a nothing worth to look at. The design of the new Wings500 look was expensive in those days, I paid over $40,000 for it. Yes, quite some money, it did cost that much in 1998. The Wings500 Collectors CD was the first CD showing all those rare herpa models in pictures, we were out on the market before herpa released anything like that. Wings500 was first and best, again. Herpa started a forum which was not used at all in the beginning (I think it is still a bit dull today). If you wanted to know what happens, Wings500 and our many supporters world wide was the ONLY source! 1999 and 2000 were very busy years. I travelled a lot and added 1000s of models to the database, taking pictures of rare and very rare models in the US, England and Hong Kong during my business trips. I remember DAC was founded in 1999. Dan Asher, founder of Gemini Jets, wanted me to start Wings400. I asked him to provide free samples for reviews - that idea was already in my head those days - but his partners did not agree. So he started DAC with the help of Gordon Werner. The new model database was moved to an Apple database server running on php. I asked Todd McCartney if he was interested to put together a team and run Wings500 together with me staying a bit more in the background. He agreed and the team took over the content management. I re-named the site Wings900 to reflect the changes in the market. Model reviews was developed by me and Todd together, we also wrote the very first reviews. In 2001, Little Jet, a company that I worked for to develop a 1:200 model line, did decide to close the doors which brought a lot of trouble for me. In 2002 the new team showed that they were able to handle site very well. Still being the owner of Wings900, I was in close discussion with Todd about how Wings900 should continue to grow and we both were confident that the site would continue it's success. Some smaller websites joined into Wings900. When I suggested to start talks with DAC about buying the site, Todd laughed about me. The new team insisted on a new logo. After we reviewed tons of designs made by a design company, which I did not agree on at all, Todd and team came up with the new minimalistic look with no logo. Todd was working hard on a complete new site design. I started to sell off my huge model collection and decided to finally sell Wings900 in 2003. I had a good offer from a US company which would bring back at least some of the money I had invested. The team was quite unhappy about my plans to sell Wings900. They asked me to consider the team as the new owners. They could not come up with the money in one sum, but we finally agreed on a payment plan and in November 2003 I happily retired from Wings900, being glad to see the site in the hands of a dedicated and capable team. AirlineLogos.net - Largest online database of Airline logos - over 4,400 and growing! 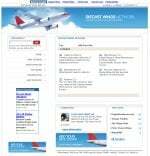 November 27th, 2007 - Wings900 Celebrates its 10th Anniversary!